Ever wish you could have a big fat bass right there on your guitar? Me too. I’ve tried all sorts of stuff like octave pedals and 8-strings, and they’re all fun, but nothing quite does what the A Little Thunder pickup does. It takes your lowest two strings and shifts them down an octave or two. You can output the signal with your regular guitar sound or you can wire it up so you can send it to a whole separate rig. If you play metal or stoner styles you can get some hugely fat sounds. If you play jazz you can do some amazing walking bass stuff. If you’re a solo singer/guitarist you can really, really flesh out your compositions. But it’s not the “If you’re a [this] you can do [this]” applications that excite me the most: it’s the stuff that we can’t even envision yet that people will be using this for. Andy Alt has launched a Kickstarter to get this baby happening and there are plenty of great perks, my favourite of which is lunch with tech-to-the-starts Thomas Nordegg (Frank Zappa, Steve Vai, Dweezil Zappa, Mike Keneally). I’d like to think that Thomas would show up for lunch with some kind of MIDI-enabled, LED-festooned Ultra-Spork. But there’s also – get this – a 1987 Ibanez RG550 Roadflare Red prototype signed by Steve Vai and with A Little Thunder installed. Sweet, huh? One of the really fun things about being a guitarist is that once you’ve figured out how to change pickups, you’ve unlocked a really easy way to completely overhaul your guitar’s sound – or to fine-tune it. Recently I found myself going back and forth between two guitars, each outfitted with a DiMarzio Crunch Lab 7 and LiquiFire 7 set. One was my Ibanez UV777BK, and the other was my Buddy Blaze Sevenator prototype. Both guitars sounded cool, but I found myself wishing for something a little earthier for the poplar body of the Blaze. Something with a bit more hair and rock attitude compared to the very midrangey, slightly boxy quality of the Crunch Lab. Poplar has a similar tone to alder, except it seems to have a slight upper-mid crispness to my ears. I asked the folks at Seymour Duncan what pickup would give me the sound I was after (keeping in mind the poplar body) and they recommended the Full Shred, so I gave it a shot. Seymour Duncan’s Blackout and Livewire active pickups are utterly killer, with their unprecedented power and monster tone, but not everybody wants to play actives. Some don’t like their attack, some don’t like their tone, some don’t like their headroom. Some simply want a fat-sounding humbucker with plenty of output. 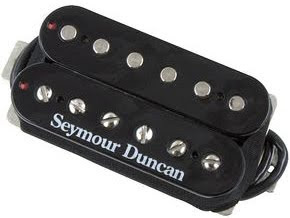 For them, Seymour Duncan offers the Alternative 8 passive humbucker. The 8 in the Alternative 8’s name is derived from the Alnico 8 (Aluminium/nickel/cobalt alloy) magnet at its heart – in fact, this pickup marks the first time this magnet has been used by Seymour Duncan. The Alternative 8 has a DC resistance of 17.68k, making it one of the hottest passive humbuckers in Seymour Duncan’s history, almost stepping on the toes of the mighty Distortion Parallel Axis, a ceramic magnet humbucker which weighs in at an imposing 21.3 k. The pickup features hot coils wound for maximum output, enhanced further by the natural qualities of the Alnico 8 magnet. While a ceramic magnet might sound tight and bitey, Alnico adds warmth and presence to the midrange as well as the upper mids, while reeling back a little on the fizzy buzz factor inherent in ceramic magnets.